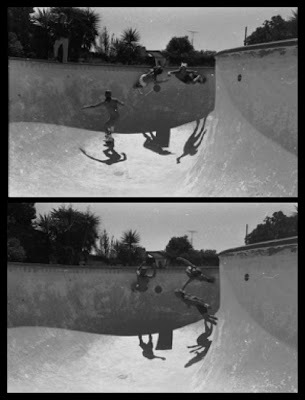 While going through my photographic archives I came across about a hundred black & white negatives of a pool skate session in California. Lonnie Toft and Richard Vanderwick were just two guys in a very talented bunch that hit the empty pools around Ventura. Sequence shots and the crew. Check out the four truck board in the foreground of the group shot. I remember seeing Lonnie get right up on one wheel on the coping with that monster. Lots of scanning to be done but more coming shortly. Once this is done the book will start.